Ownership / Access: Now houses the Fermanagh County Museum. Open to public. Notes: Enniskillen Castle is situated in Enniskillen, County Fermanagh, Northern Ireland. It was originally built in the 16th century and now houses the Fermanagh County Museum and the regimental museum of the Royal Inniskilling Fusiliers and the 5th Royal Inniskilling Dragoon Guards. The first castle was built on this site by Hugh Maguire in the 16th century. It featured greatly in Irish rebellions against English rule in the 16th century and was taken after an eight day siege in 1594. In 1607 it was remodelled and refurbished by Captain William Cole. The riverside tower at the south, known as the Watergate, was added at this time. In the 18th century the castle was remodelled as the Castle Barracks. 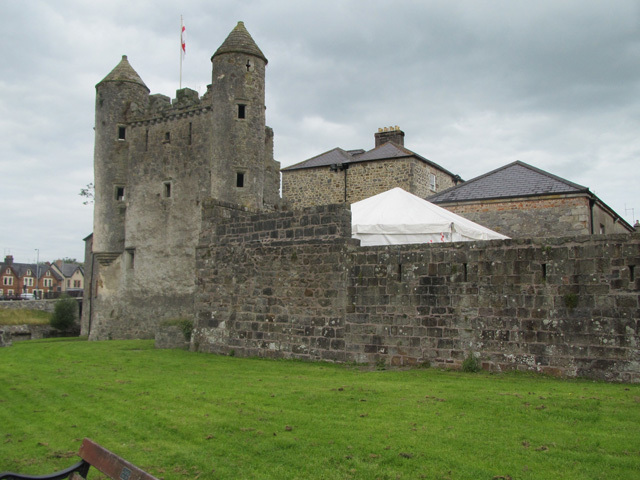 The Castle provided the main defence for the west end of the town and guarded the Sligo road. It consists of two sections, a central tower keep and a curtain wall which was strengthened with small turrets called Bartizans. The design of the castle has strong Scottish influences. This can be particularly seen in the Watergate, which features two corbelled circular tourelles which were probably built about 1609. Since then it has been substantially rebuilt. It is a State Care Historic Monument.The castle is now home to the Fermanagh County Museum, which focuses on the county's history, culture and natural history. Exhibits include the area's prehistory, natural history, traditional rural life, local crafts and Belleek Pottery, and history of the castle. The castle also houses the Inniskillings Museum, which is the regimental museum of the Royal Inniskilling Fusiliers and the 5th Royal Inniskilling Dragoon Guards. Displays include uniforms, medals, flags, regimental regalia, weapons and other military memorabilia.